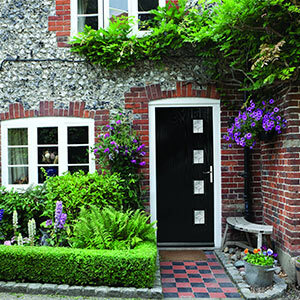 With modern homeowners wanting more security than ever before means the things to consider when selecting new doors for either residential or commercial properties can be very complex and confusing…. However, we understand these challenges and that’s why ALL our UPVC doors are designed and built to exceed your expectations. As well as being seen in an attractive range of colours and finishes to suit both domestic and commercial properties, each has been very carefully precision-engineered to ensure optimum functionality. On a warm summer’s day, there’s nothing better throwing open your house to the elements, letting the fresh air come flooding in. Our French doors are a more traditional style and full of character. Unlike timber, using UPVC gives you more options than ever before. They also come with some real benefits, such as the latest security and superior energy efficiency. If you’re looking for a simple, cost-effective and attractive solution to bring more space and natural light into your home, sliding patio doors are the perfect option for you. Offering both value and versatility, it’s easy to see why they are the most popular model in the whole of the UK. With our UPVC sliding doors from Eurocell, you can have lots of options to customise your Patio doors to your home. The specification is unmatched in the Composite door market, thanks to the solid timber core build of our products and thanks to our exclusive agreements with specialist suppliers of door furniture and hardware. Our 48mm doors are 10% thicker than our nearest competitors, helping make them the most secure and energy efficient money can buy. We offer 256 colour combinations with an option of having 20 colours on either side. These range from contemporary colours to luxurious and lifelike woodgrains. Our products are also extremely secure, thanks to our Avantis lock which carries the industry’s largest deadbolt. This imitates the appearance of traditional key operated locks on Period doors yet features high-security multi-point locking as standard. The advantages of selecting the Bi-folding option are that they can fold all the way back to allow the best outside/inside living. Unlike traditional sliding doors, which only open up half of the space, Bi-folding options can fold right back to just a few inches of the opening, this means that there is a greater space. This allows you to get a real sense of freedom when on a good day you can open up your home and bring the outdoors in. Our Bi-fold doors benefit from multi-point stainless steel locking mechanisms, toughened/laminated glass and come with a high-security lock cylinder. When looking for an installer of new front doors in Essex, it is essential that you are working with a professional and experienced team. Our team are fully trained on being both respectful and considerate when working in your home. 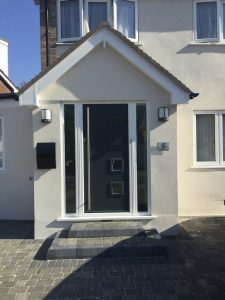 Sovereign Home Improvements has a team of dedicated team of professionals with who have more than 30 years combined experience at fitting doors in Essex, Southend, Grays, Basildon, Romford, Brentwood and many more Essex towns. Whether it be new doors in your Essex home, Composite doors, uPVC doors, Patio Doors, stylish French doors, modern Bi-folding doors, weather-proof draught-proof doors, stylish and secure doors (with police approved locks and security) we have the tools and experience to fit them for you! 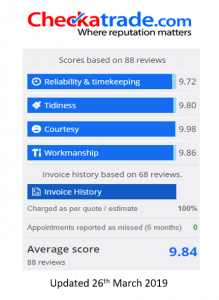 We are a family business and therefore wish to see our clients and cutometers given the best possible advice, ensuring that they are both satisfied with the way the project is both managed and completed. As such, we believe in taking the time to fully understand your requirements and understand the look you are trying to achieve. Only then do we make recommendations for front doors in Essex, depending on your timeframe, budget and longer-term plans for the property. Why? Because we want to come back time and time again to use our installation services time and time again. We love our work and we look forward to making many more homes and doors in Essex Better!